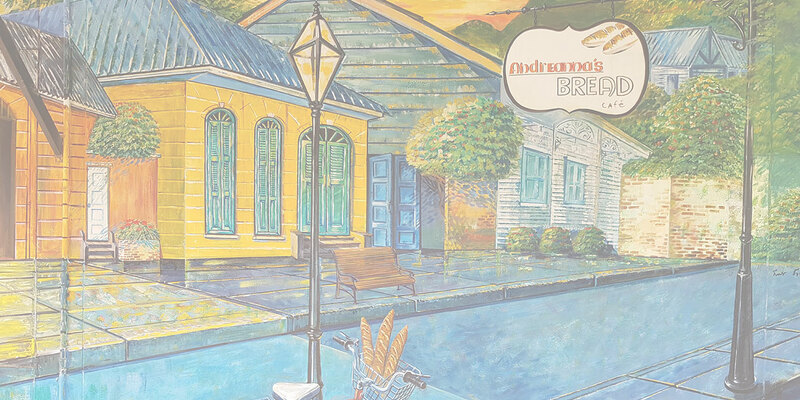 WOW…Andy’s mixing things up at Andreanna’s Bread Cafe! Andy’s been putting a great show of food on for his new Sunday set lunch menu and weekend BBQ’s. 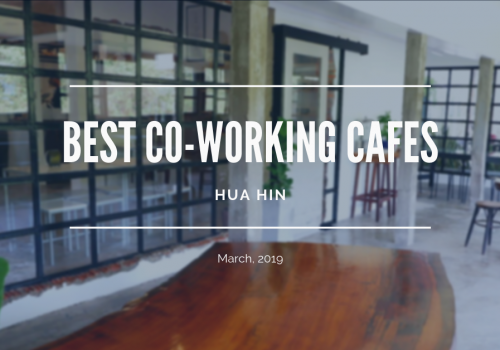 Not only is he showing off some great food, but the cafe/restaurant has much more comfy and “balmy” vibe to it with indoor plants hanging and placed around the cafe as well as some funky new furniture – you can almost find any type of seat/chair/couch in this place now. 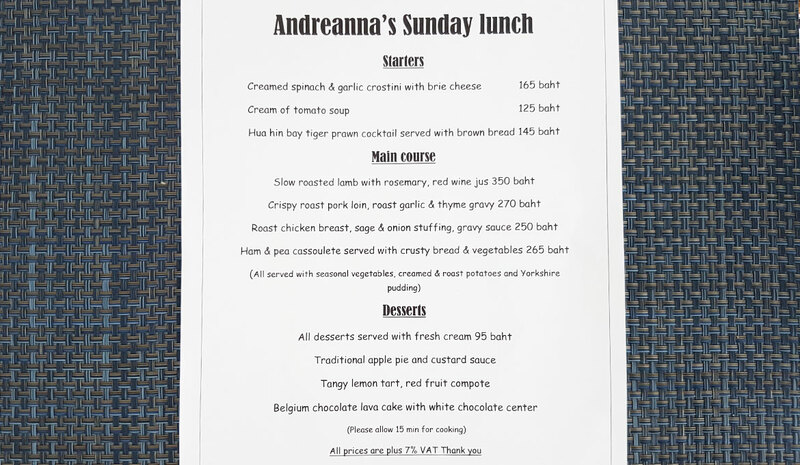 Andy asked me to pop down today and try out his Sunday lunch menu (starting at 12:30pm)…he promised me I’d like it! :-). 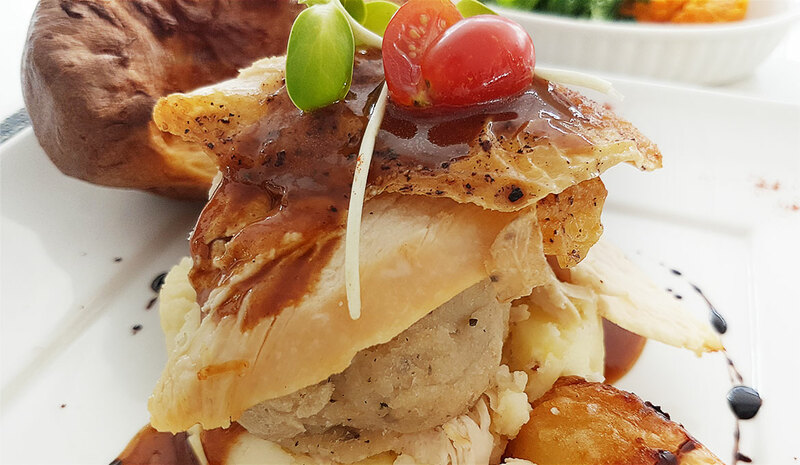 Anyway, with the rainy weather we’ve had lately I thought it was a good option as it’s close to home and you never when it’s gonna pour down with rain at the moment so I locked that in for my Sunday lunch. To get in on all the action I arrived at 11:30am to check out things as they were being prepared, although I could tell by the amazing smell of fresh herbs, seasoning, roasted chicken and pork they were already well under way by the time I arrived (as you’d want to be I guess). Damn it! Now they made me hungry and they weren’t serving for another hour yet! The set menu has a good selection to choose from, and although I couldn’t eat everything on the menu, I got to taste a good selection of the dishes. The first thing I tried out was the Ham & Pea Cassoulete, although Andy said it still needed more seasoning added I thought the natural flavours coming out of this baby were pretty amazing – but Andy knows what he’s doing so I’m sure it only tasted better with the seasoning. It actually reminded me of a nice chunky soup on a winters day back home – and yes – the perfect time to try this dish because like I said, it has been quite “wintery” here the last week or so it really felt like back home (“wintery” is still 30 degrees – just with rain). 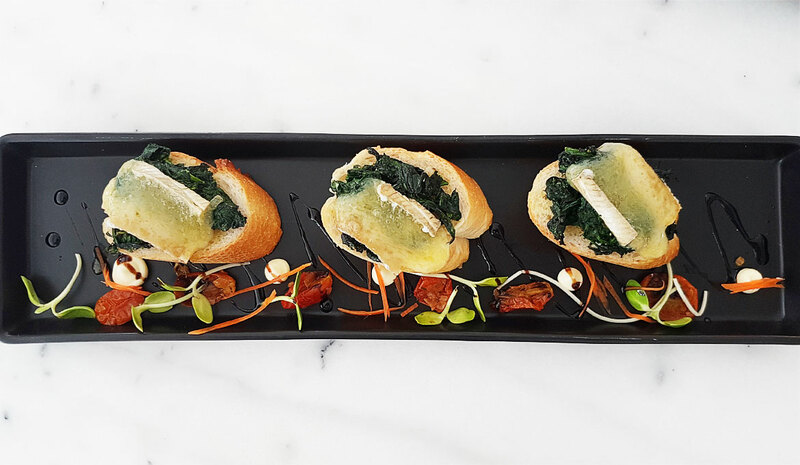 Next dish to try was the Cream spinach and Garlic Crostini with Brie Cheese – W..W..WOW! 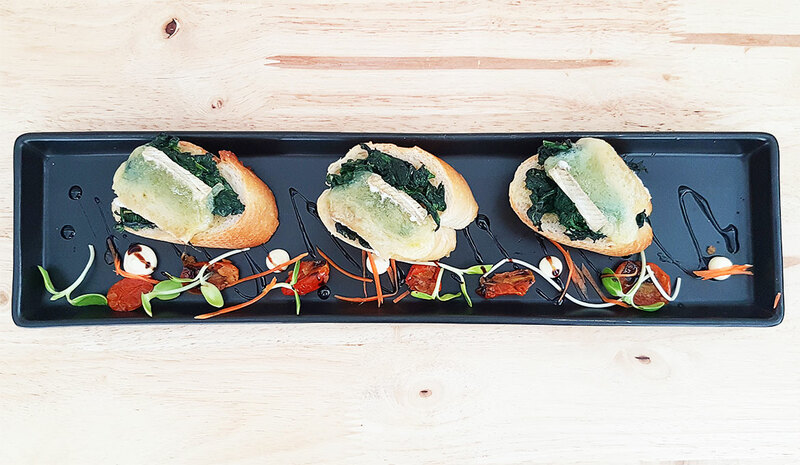 Heaven on bread (or should I say Crostini). The baguette – well these are always nice, fresh and fluffy being a bakery and fresh outta the ovenl, but the cream spinach and brie cheese topping makes this dish so tasty and unique! It could be a common dish but I’d never tried it before, but absolutely loved it and definitely keen to try this again! 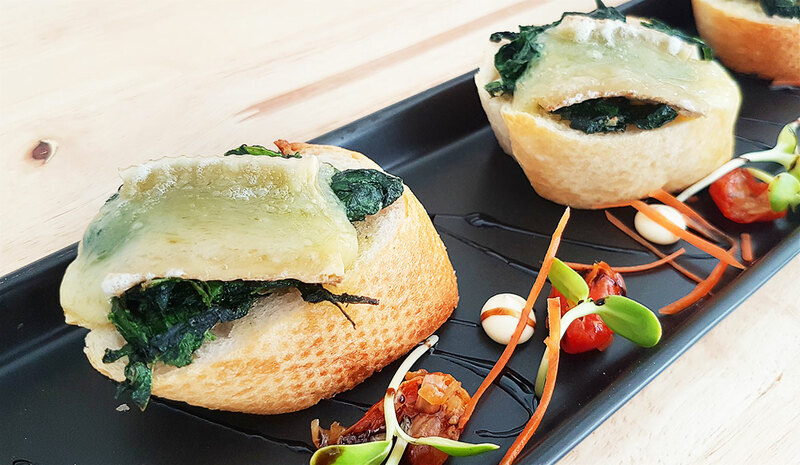 The brie cheese was still nice and warm when served so it just melted in your mouth. The spinach topping with cream gave the bread that perfect softness on top but not soaked all the way through so the bread was still fluffy. It had been briefly toasted as well so the edges/crust was nice and crispy, but not too hard either. yum yum yum!!!! Now it was time for the main – Roasted Chicken!!! 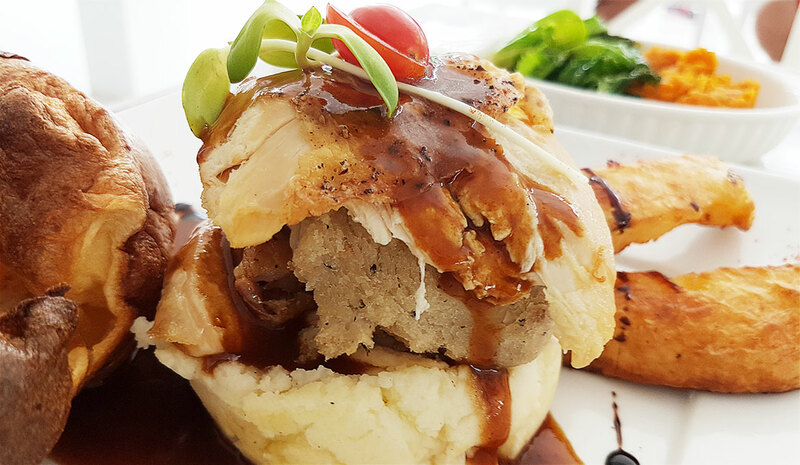 To be precise – “Roasted Chicken Breast with Sage and Onion Stuffing and Gravy Sauce”. 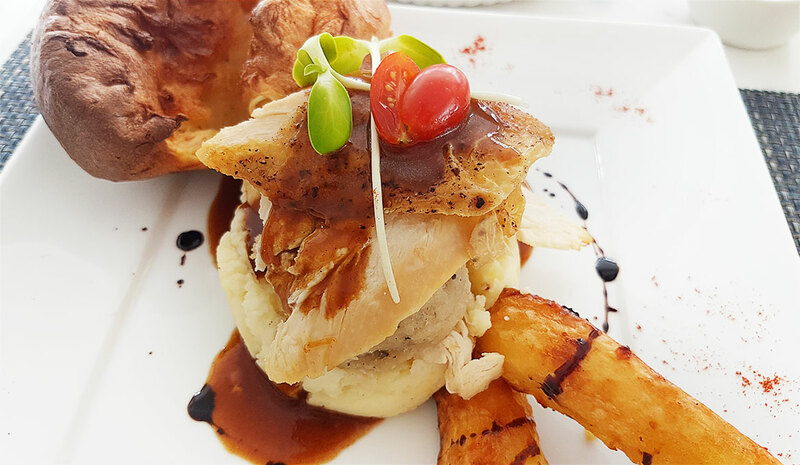 I checked the roasted chicken out before being served out the back in the kitchen – it looked great and cooked perfectly so I was looking forward to digging into my main. Being in Thailand, you don’t have a good selection of red meat, so chicken is probably my preferred meat dish when ordering a meal here – and the best way (in my opinion) chicken can be cooked is roasted with herbs…so I was pretty much waiting for one of my most favourite dishes in Thailand! When the meal came out, it was HUGE! for 250 Baht…incredible value!! I wasn’t going to finish all of this meal so I had to make a plan of attack to make sure I could get the right amount of all the bits and pieces accompanying the chicken without rolling out the door. 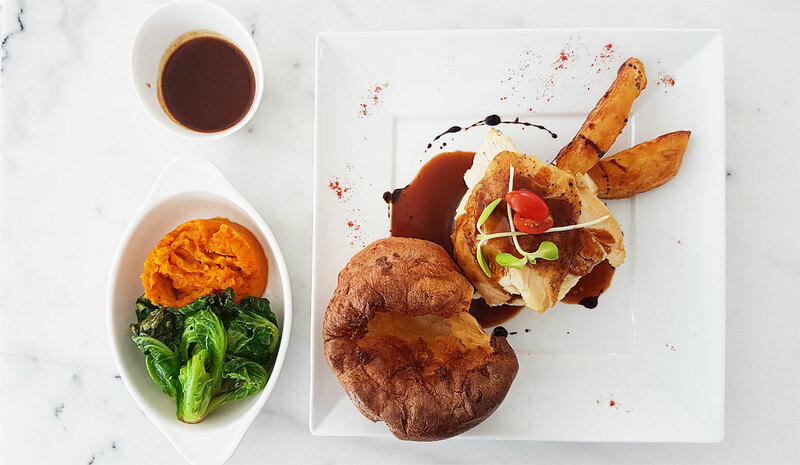 The sage and garlic was a nice selection and the flavour’s really seeped through the meat nicely, not too strong and not to weak – just perfect! The chicken sat on a bed of nice creamy soft mashed potato. The mash was nice and fluffy but also very filling, so I only had a few mouth fulls of this before moving onto the Yorkshire pudding. Now I’m not a Yorkshire pudding man – I lived in the UK for a good 3 years and tried this famous accompaniment a few times and never saw what the big hype was about it – but having tried this one – I can now see – if done right it’s a pretty awesome pudding when loaded full of gravy! OK – now time for one of fav’s – CHIPS! But these are home cut and home cooked potato wedges. 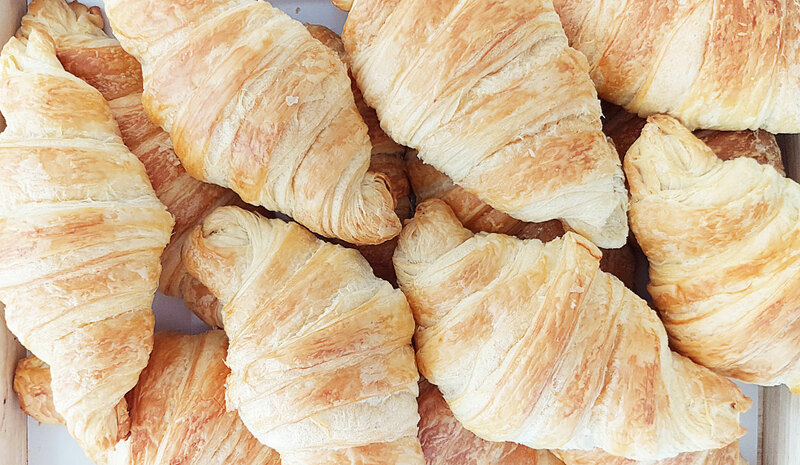 Nice and crispy on the outside and soft and fluffy in the middle – couldn’t ask for better! And now for the dessert! 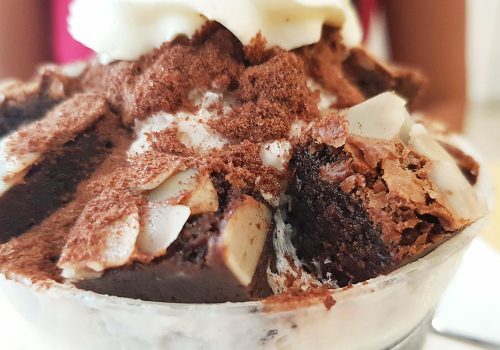 I’m not a dessert person – in fact it’s rare you ever see me having something sweet with a meal unless it’s sugar in my coffee – but being a special Sunday lunch menu and one of the best cafe’s in Hua Hin for pastries and desserts – if I were going to try a dessert, this would be the place. I opted for the Apple Pie – Andy seemed to think it wasn’t cooked well and wasn’t too impressed with it, however I thought it was great. 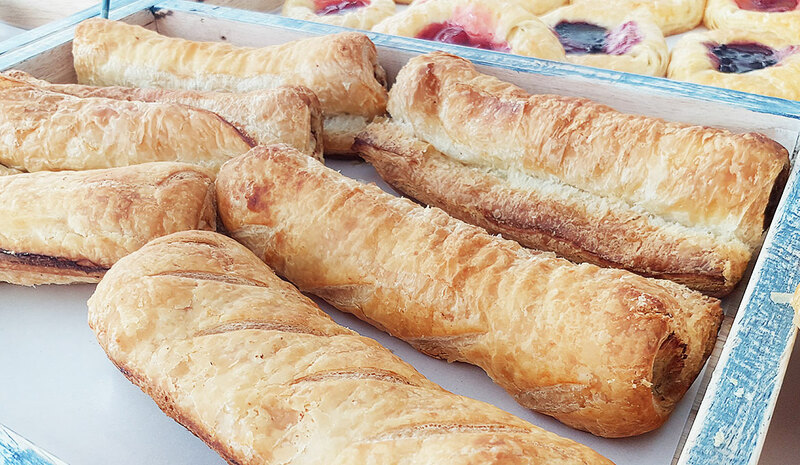 the perfect crustiness on the outside and nice and flaky as you broke through the crust with your folk. 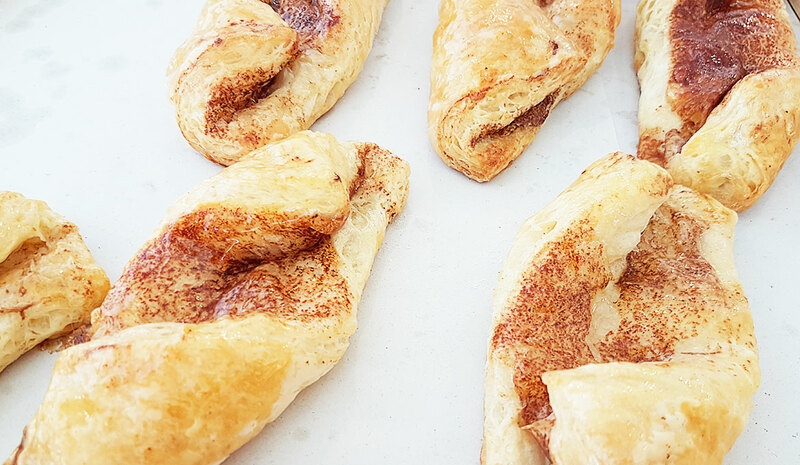 The inner apple sauce was super tasty with a nice touch blend of cinnamon – the perfect temperature too. 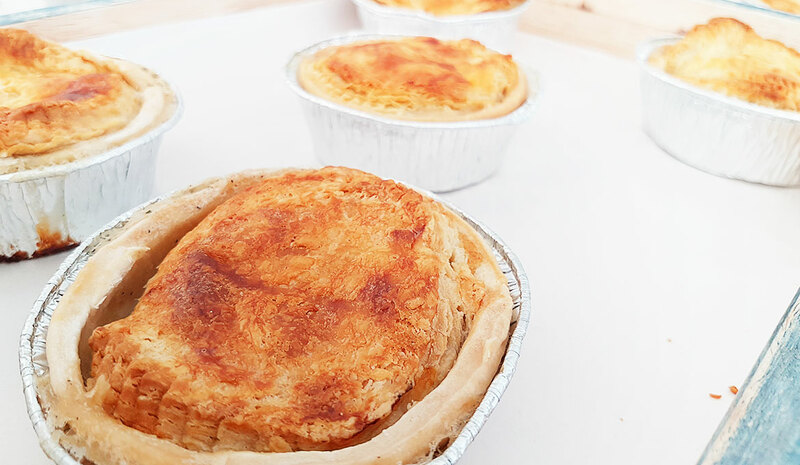 Nothing I hate more than ordering a pie (whether it be meat or fruit) and it’s too hot to bite into. 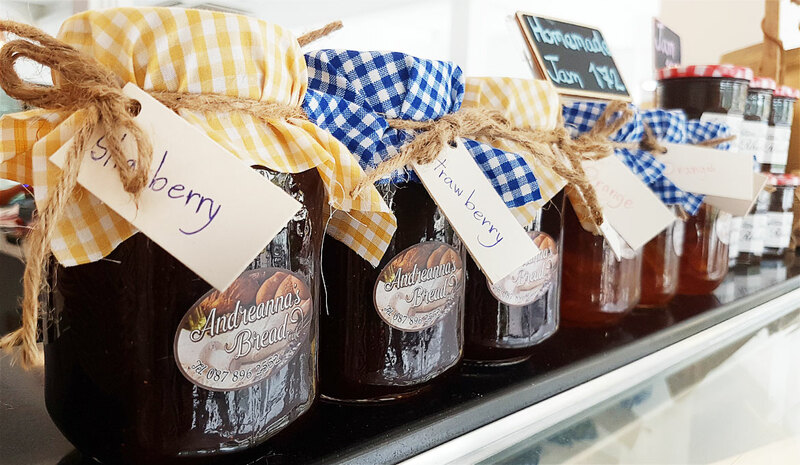 Andy has also just whipped up some AMAZING home made jams – I got have a little taste test (before buying a jar myself) and it’s probably the best strawberry jam I’ve had here in Thailand – and at 160 baht for a huge jar, it beats paying 300 baht or there abouts at Bluport for an imported jar. Anyway, I won’t repeat myself so to check out my ratings, address details and my first experience here – click on the toggle below to see my first review on this place. 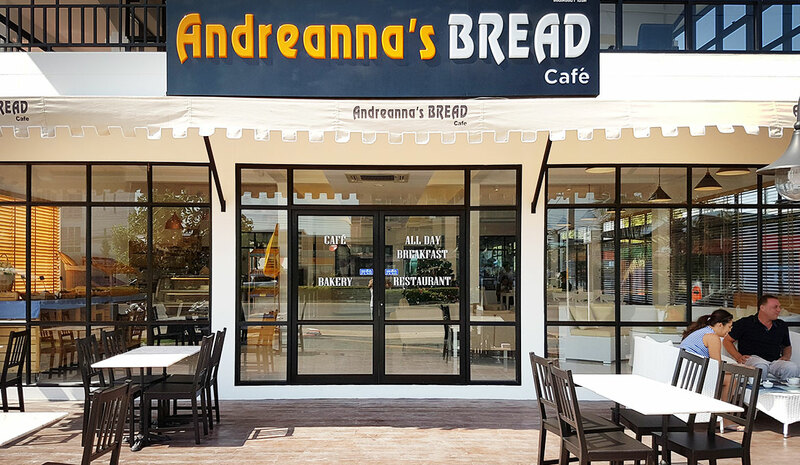 Andreanna’s Bread Cafe – a Bakery, Cafe and Restaurant all in one! 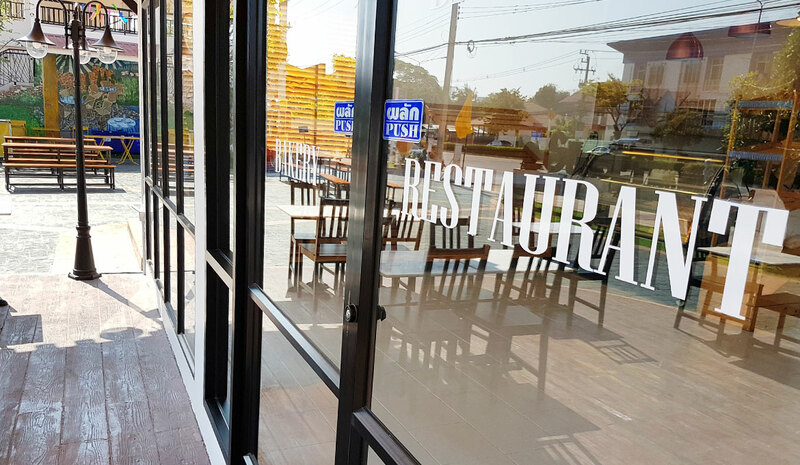 There isn’t too many places like this around Hua Hin, generally you’re either a cafe, a restaurant or a bakery – but this place has it all. For the places that do attempt to do it all, they generally seem to be good at just one thing (ie. cafe, restaurant or bakery) and lack on the other 2 – I was interested to see if this place could pull off all 3. From the outside the place looks really inviting – with its tables and chairs and even cushioned lounge type chairs outside – this place really does say “come on in and relax”…and so I did! 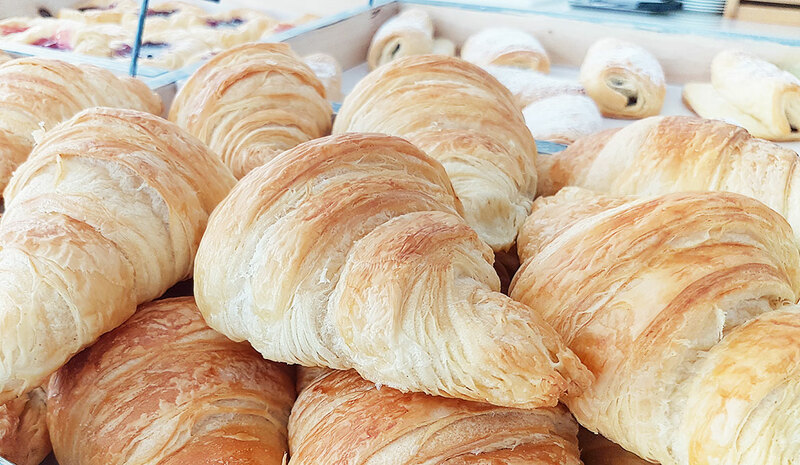 The smell of fresh bread and pastries hit me as soon as I came through the doors. 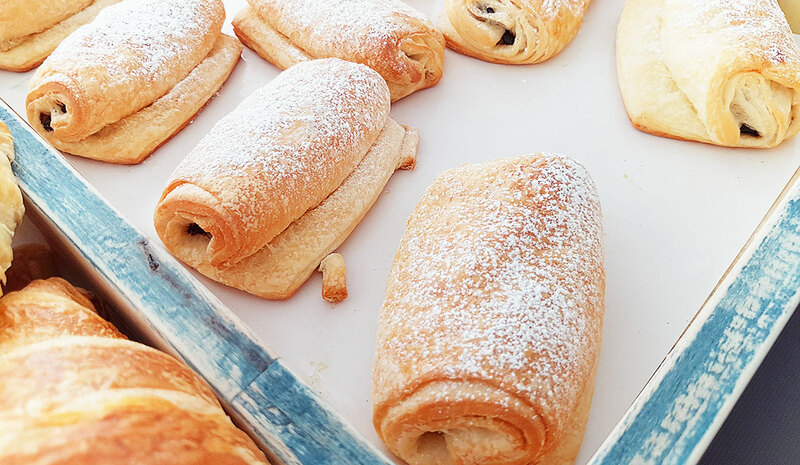 To the left there’s a large counter with shelves and benches stacked with fresh pastries and a range of breads. The first thing I noticed looking at the breads and pastries was the crispness and freshness of it all – there was artisan behind these creations and a love for his work – sausage rolls and croissants with a flaky and crispy pastry, breads with a crispy outside crust, baguettes, cinnamon scrolls, tarts…it seemed this baker had perfected the art of a crispy filo pastry – just check out some of the photos and you will see what I mean (I still want to bite into them each time I review the photos). My first visit was just for coffee (although hard to say no to the pastries) but figured I’d have a look at the menu as well. The chef offered to show me the latest menu which wasn’t actually available at the time but was about 1 week away – Wow! 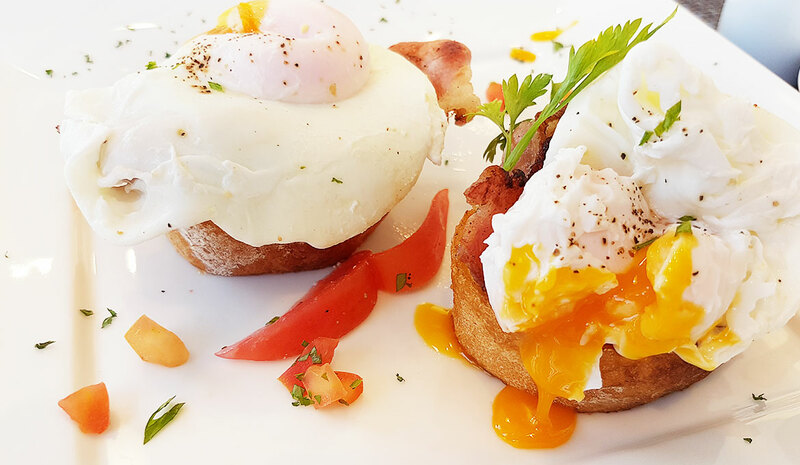 The menu had it all including my favourite “Eggs Benedict” and “Eggs Florentine” (not to mention all the other stuff like omelets, scrambled eggs, muesli, baguettes, sandwiches…) the list goes on! I ordered a cappuccino – the wait time wasn’t long and it was presented well with a creamy and fluffy foam and a nice size cup. 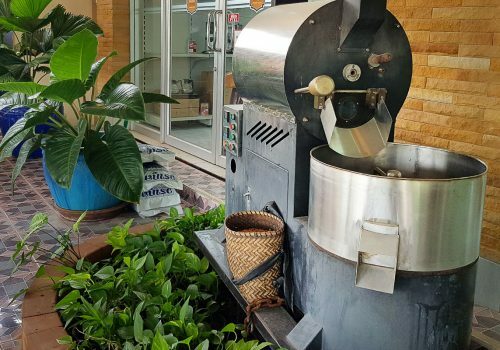 The coffee had a nice strong flavour due to the fact the beans are roasted here in Hua Hin and sourced raw from the most popular coffee growing hub in Thailand (Chiang Mai). The coffee wasn’t as strong as I would normally like it – so the next time I ordered my coffee with a double shot and Voila! Perfect! 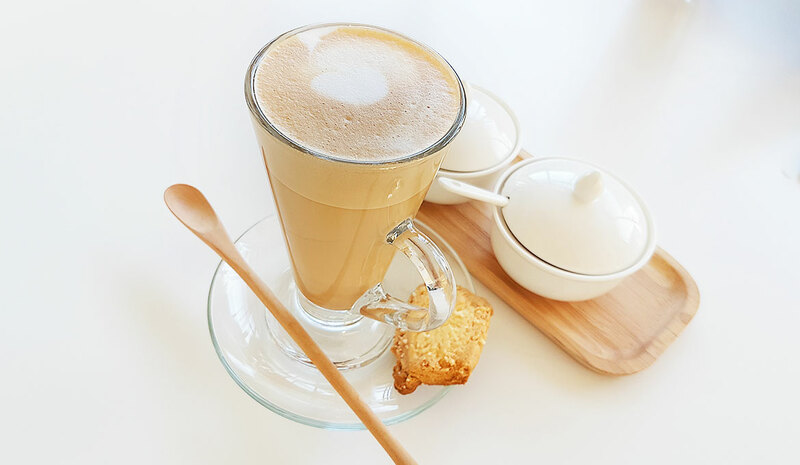 – I’ve also tried the latte here as well – and the taste doesn’t differ much however the presentation is quite different and unique (for Hua Hin) as the coffee comes out in a cool shaped glass and just looks…well…interesting. At the end of my visit, I couldn’t leave without a loaf of bread or a baguette after sitting there smelling fresh bread coming out of the baking room for the last hour, so I ordered a baguette to take with me. 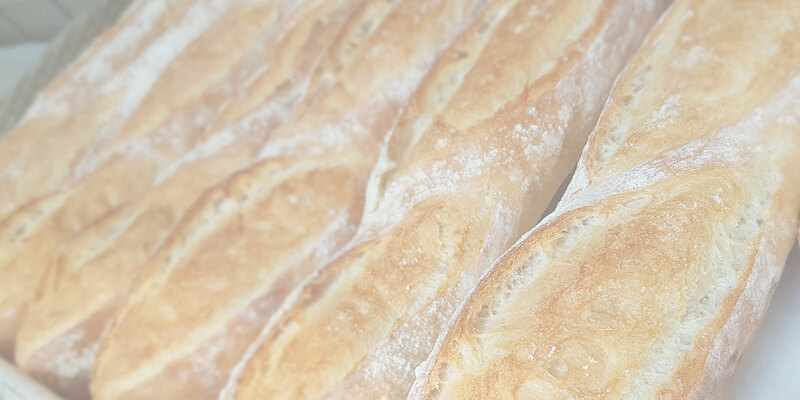 The baguettes are quite large however not too heavy – really light and fluffy in the middle with a crispy crust – perfect for making a salad baguette or just spreading your favourite jam on top! 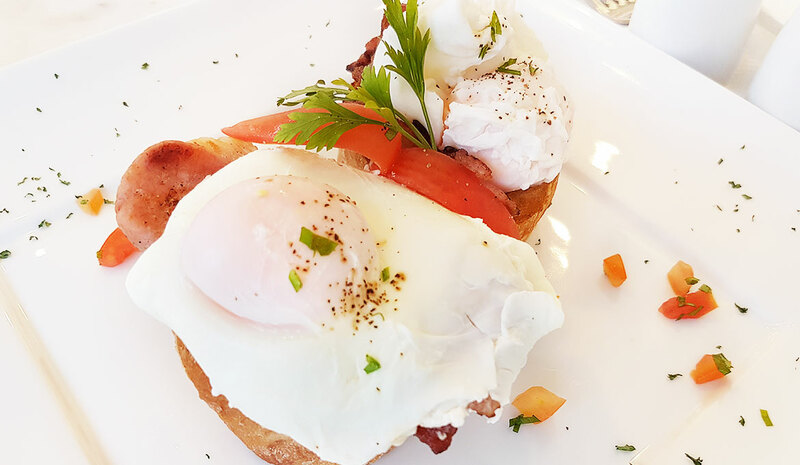 As for the food menu, I did eventually come back for the eggs benedict – how could I not! and there’s some nice photo’s in the gallery to show the quality! 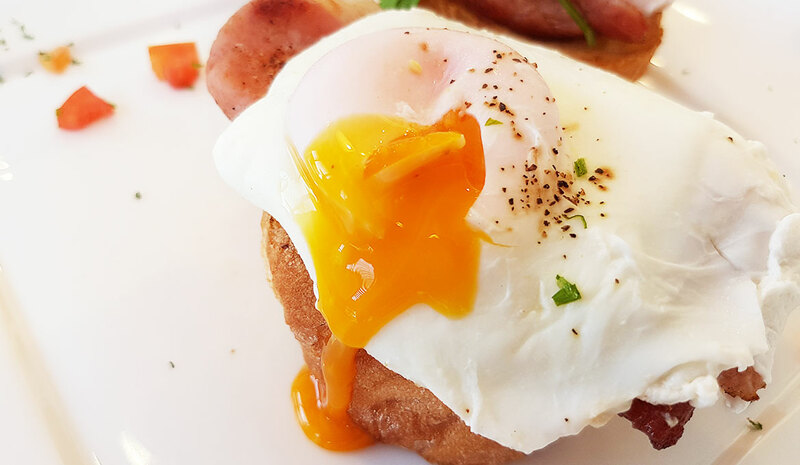 The eggs were cooked to perfection – in fact probably the runniest yoke I’ve had in Hua Hin, but not under cooked. 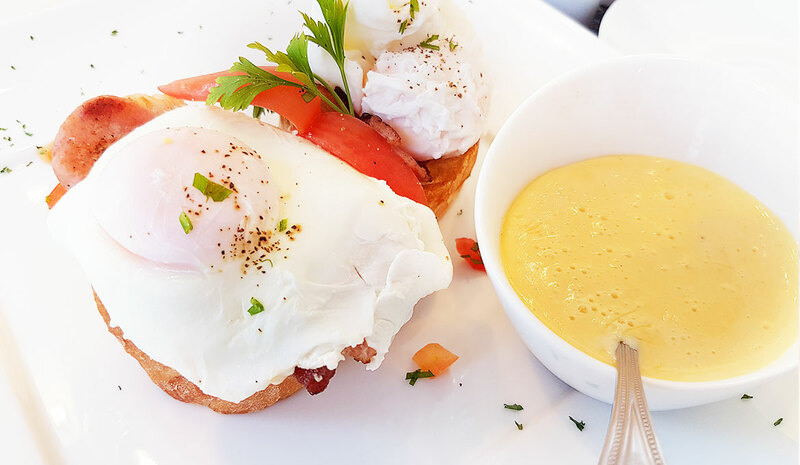 The eggs were served on two thick slices of a lightly toasted baguette (brushed with a little butter) and Hollandaise sauce that is NOT sweet (which is hard to find in Thailand as most sauces generally have a sweetness to them and normally taste more like mayonnaise). 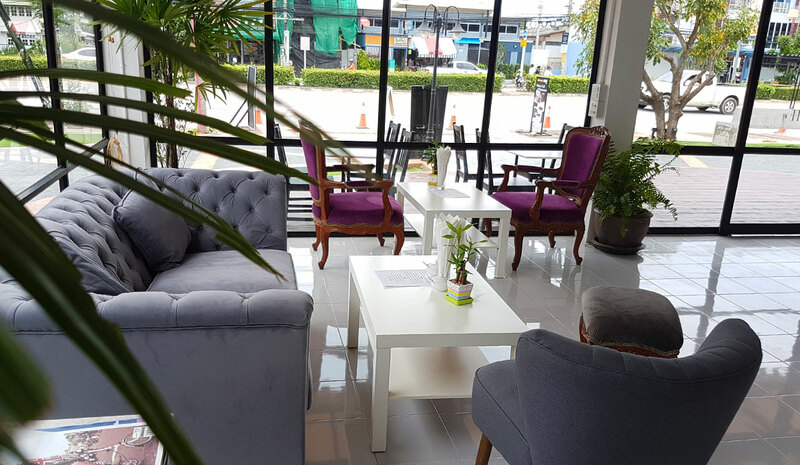 There were a heap of seats to choose from including normal table and chairs for dining and sofas with coffee tables for a more relaxed and chilled experience. 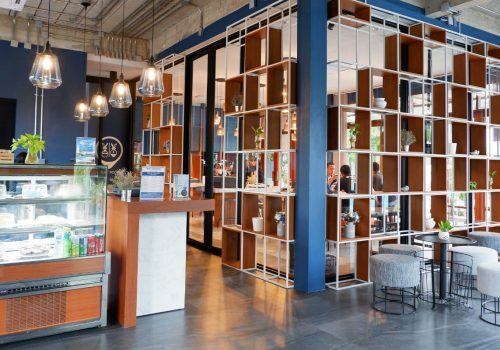 The restaurant is surrounded with large glass windows to let all the light in so there’s a nice brightness to the place – and I love this because it makes a place feel more spacious and gives me a clear head! Basically I was in my element. So did they pull off all 3 (Bakery, Cafe and Restaurant)? 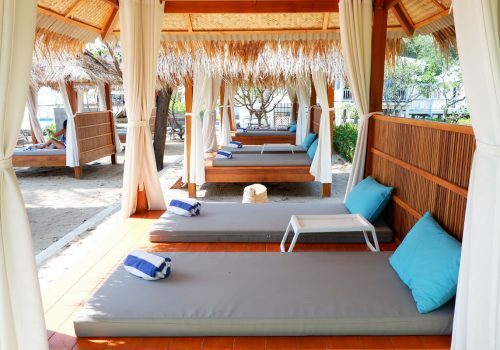 – “Yes” in my opinion which makes this place one of it’s kind in Hua Hin and definitely worth a visit. 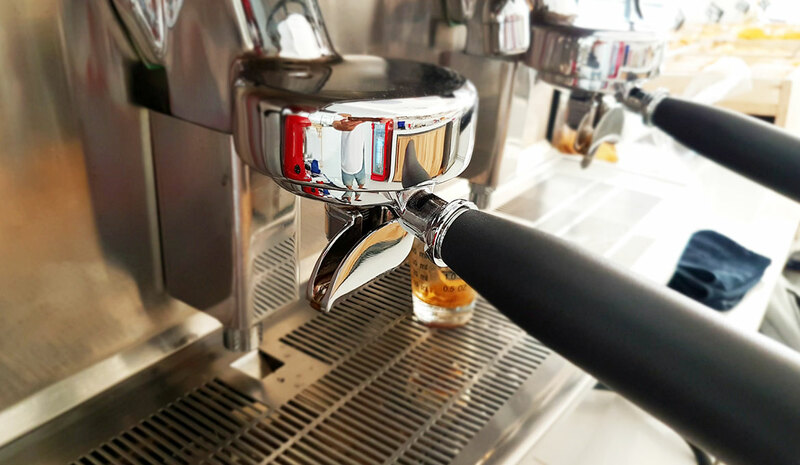 The smell of fresh breads and pastries coming through the door and the feeling of “make yourself at home” – I feel really comfortable in this place and come here most days at least for a coffee because I can set my laptop up and feel right at home. Well I guess the question should be when will I stop going back? They’d have to do something drastically wrong I think – but in answer to the question “yes” – as I said previously I come here almost every day. If you’re coming from Hua Hin, the best option is take what looks like a green Tuk Tuk (but a little bigger – more like a mini bus). 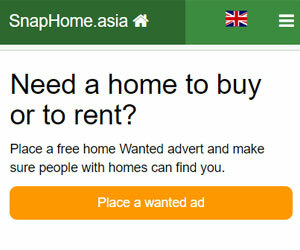 You can get them normally from the clock tower on Phetkhasem road in Hua Hin. 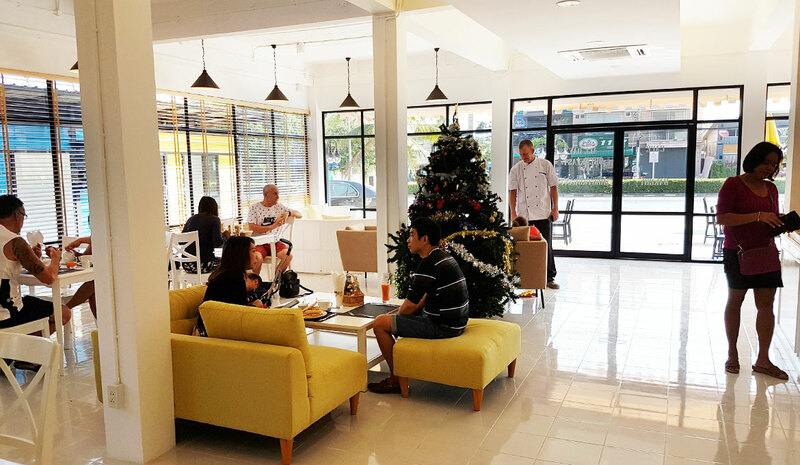 You want to ask for the bus to “Khao Takiab” – which will head south about 4-5km’s before reaching the cafe. 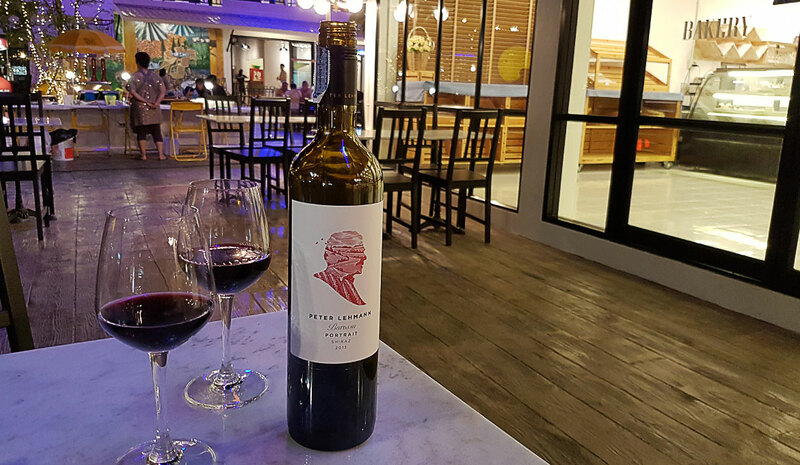 It’s located in a complex called “The Sunset Hua Hin” – however being farely new, not many people know about this – so other big landmark to ask for is “Cicada Market” – if you get off at Cicada Market it’s basically on the opposite side of the road about 30 meters back towards Hua Hin. It’s actually in a good little spot because with the new Sunset Plaza being built there’s a number of other little shops inside the plaza and you have Cicada Market and Tamarind Market just across the road. 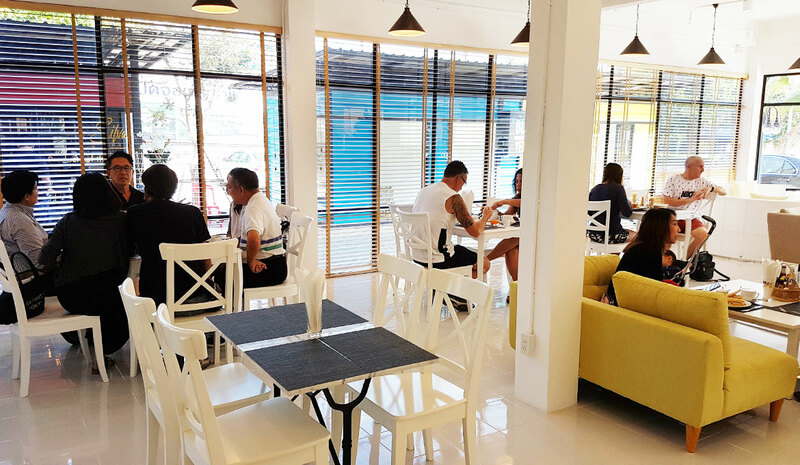 You could really make a day trip out of this one and head out to Andreanna’s Bread Cafe for a coffee and breakfast (or brunch) and then down to Khao Takiab beach, grab a deck chair and chill for the afternoon. 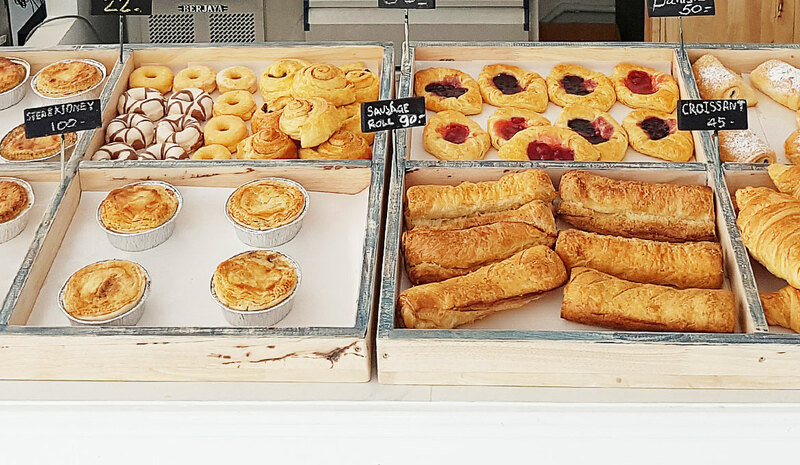 If it’s the weekend – you can head up to the markets in the evening and spend a few hours looking around (really worth a look). 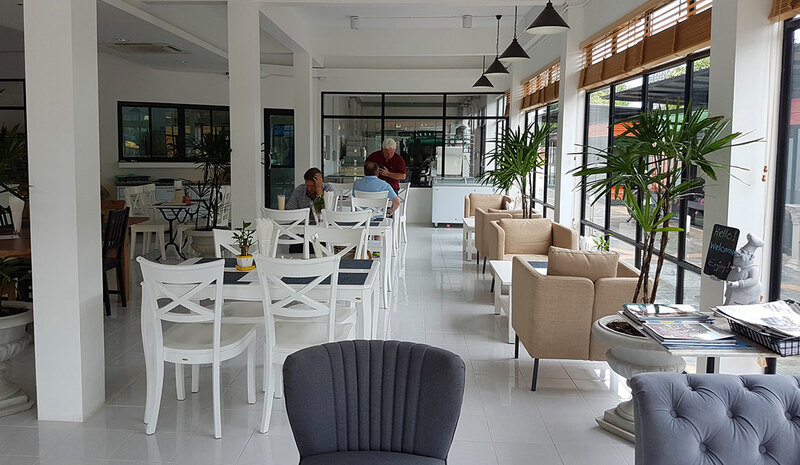 Really well priced – the coffee is up there in the top 5 of Hua Hin in my opinion (75 baht from memory) and it’s cheaper than most of the places serving very average coffee. 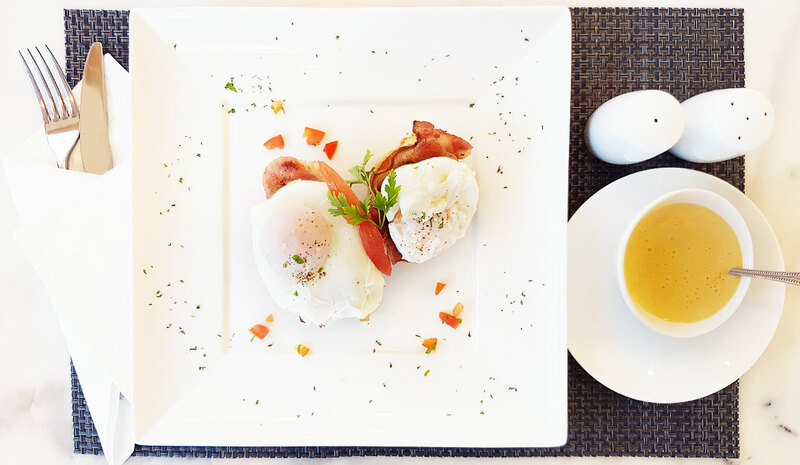 The meals are well priced with the breakfasts ranging between 100 – 280 baht depending on what you get – obviously the Eggs Florentine with salmon etc. 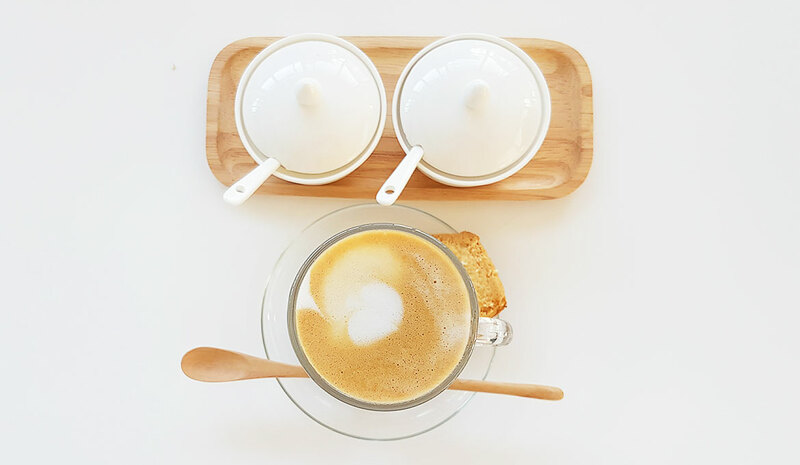 is on the higher side – but based on what you get and the quality, the prices are really good. 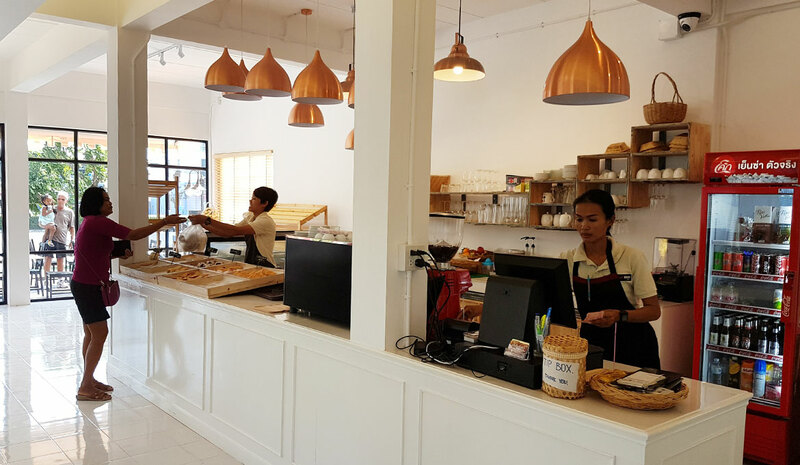 The breads can be anything from 60 – 150 baht (maybe even a little) depending on the load you get – A standard good loaf of bread will be about 45 (small loaf) – 100 baht (larger load – eg. Italian Ciabatta loaf).